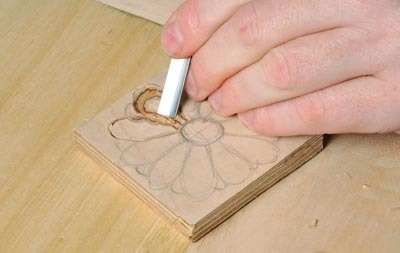 Tools from Pfeil are marketed as ideal for the carver with smaller hands. It is true that there are some carvers out there, especially women (and especially me) that sometimes find the normal sized tools just that little bit too cumbersome to use. 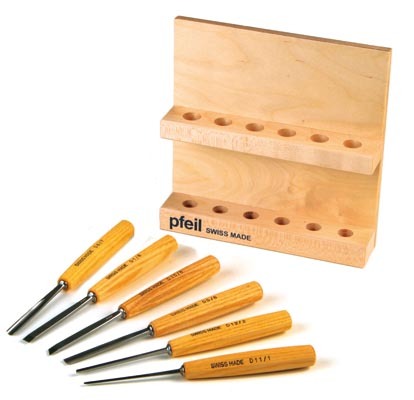 Comfort will sometimes be sacrificed in order to achieve the end result, and often, the results may be disappointing as a consequence, so it is interesting to see that Pfeil have looked to address this problem with their medium sized range of tools available as a 6, 12 or 18 piece set, and supplied in a wooden stand. The overall length of the tools are 200mm with a blade length of 85mm, but are made to the same standard as their bigger brothers. Having used the excellent bigger tools, I had at least something to compare them with. The medium sized set felt comfortable in the hand right from the start. I found it easier to get behind my gouge and exert the necessary control and pressure to achieve the cuts required without feeling any discomfort from awkward handling. The No.11 veiner and the 60 degree V-tool offered superb results, as did all the tools, but I was particularly impressed by the way these handled and felt. Overall, I was impressed with this 6 piece set. I personally would liked to have seen a fishtail included in the range to vary the selection a little bit more, but otherwise, I really could not find any fault with these fine tools. Depending on your requirements, you may want to look at the 12 or 18 piece selection but the 6 piece is a good place to start. Those with bigger hands may find that they have to hold the tools differently to how they might normally but for someone like me with petite hands, technique is much improved and for that I cannot ask more!